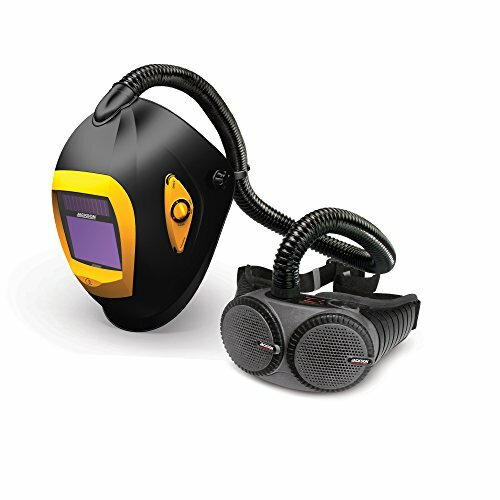 Protect yourself from the respiratory dangers of welding fumes and heat stress – without sacrificing visibility – with the AIRMAX ELITE PAPR from Jackson Safety. This welding helmet delivers the best in class optical clarity available in a PAPR, coupled with an enlarged viewing area and an auto darkening filter with Balder Technology to reduce eye fatigue and enhance welding accuracy. The flame-retardant face seal protects against sparks while audible and vibrating signals indicate when the battery or filter needs to be changed. Don't choose between comfort and compliance. Get both with the AIRMAX ELITE PAPR from Jackson Safety.BH3 Air welding helmet features variable auto darkening filter with Balder Technology. The Balder Technology provides superior optical viewing clarity from any angle along with one of the largest ADF viewing area of 3.78” x 2.70”.Variable ADF with grind mode. Adjustable shades 6-8 (torch) and 9-13 via external knob. Flame-retardant face seal around welding helmet protects against sparks Lightweight blower with advanced control system to maintain constant air flow rate throughout the charge of the battery. Audible and vibrating alarms signal welder when need for new filter or battery change. Blower unit display also provides visual status of the battery charge and level of filter clogging. PAPR Comes Complete With: BH3 Air welding helmet with flame-retardant flexible-face seal - 48040. Variable auto-darkening filter (ADF) with Balder Technology and 1/1/1/1 optical classification- 40885. Rechargeable Lithium Ion battery (8 hour)-40864 Breathing hose with flame retardant cover Dual-speed blower unit Battery charger Waist belt. NIOSH HE filter assembled with pre-filter and spark arrestor. Air flow indicator. Storage bag. BH3 Air welding helmet features variable auto darkening filter with Balder Technology. The Balder Technology provides superior optical viewing clarity from any angle along with one of the largest ADF viewing area of 3.78" x 2.70"